Internet message boards often contain threads on Esbit and ways to improve its efficiency. Some have suggested that the distance between the burning tablet and the bottom of the pot is too close with the commercial stoves and that better results were achieved by increasing this distance. This appeals to that kernel of knowledge retained from our high school chemistry class regarding the Bunsen burner; there was a hot spot in the flame at which the beaker bottom should be placed. If the beaker was placed lower than this point, boil times increased. Shouldn't this same concept apply to Esbit? It's an interesting idea, but I have always been a skeptic when it comes to claims made on message boards. Often people test their ideas in very subjective ways, if at all. In particular, I was not convinced that Esbit's 'hot spot' was significantly higher than the pot height on the commonly available commercial stoves. But at heart I'm a pragmatist and am not married to any particular backpacking method other than a level headed evaluation of what works best in a given situation. In that spirit, a short experiment designed to evaluate Esbit efficiency vs pot height was performed. The basic idea was to vary the height of the pot, boil some water, and then determine the mass of Esbit consumed. A standard Esbit wingstove was modified by attaching 4" coat hanger wire stands to each wing with epoxy. After each test, the wires were cut to lower the stove and the test repeated. In order to keep the test conditions as equal as possible, the boiling point was determined with a lab grade analog thermometer, the water to be boiled was all drawn from a large basin with a cooking grade measuring cup, and a digital postal scale was used to determine the mass of Esbit consumed. Result: the efficiency of the heating process increased as the pot height decreased. I suspect that this is because the 'hot spot' of the flame produced by combusting Esbit is very close to the tablet itself. Probably the most important conclusion reached in this experiment pertains to people who choose to hunt up rocks with which to suspend their pots over a burning Esbit tablet. These people will quickly lose the weight savings from not carrying a stove to extra Esbit consumed during boiling unless they pay careful attention to the distance between the bottom of their pot and the burning tablet. Unrelated to this experiment but also of concern, Esbit tablets leave a residue on the combustion surface incompatible with the 'Leave No Trace' philosophy. Carry a tablet holder of some sort, be it homemade or commercial. Commercial Esbit stoves are at a height conducive to an efficient heating process. 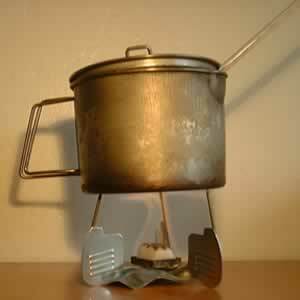 Homemade solid fuel tablet stoves should be made so that the height of the pot over the burning tablet is similar to that of the commercial stoves. Have a healthy dose of skepticism for anything you read on Internet message boards. Well-meaning people sometimes spread misinformation at these forums. This experiment was performed very close to sea level, so the temperature at which a boil was attained was 212*. Esbit combusts at a temperature of about 1400*F; if you're going to make your own tablet holder stay away from aluminum cans as they cannot withstand such temperatures. My scale only reads to the 1/10 of an ounce. It should be noted that for the three lowest heights, visually there was more uncombusted tablet as the height decreased. These tests were conducted inside without environmental conditions like wind and cold that are present in the backcountry. Esbit's efficiency is very influenced by wind. I condsider Esbit stoves a good choice for fair weather backpacking. When the seasons change, you'll find me with a more powerful stove.